Set your oven to 180C and line a cupcake-baking tray with paper cupcake liners. In a clean, dry bowl add the butter and beat continuously until the colour changes from a pale yellow colour to a cream colour. Once the colour change occurs, add in the caster sugar and beat again until combined. Add in the eggs one by one until they are beaten into the mixture. In a separate bowl, add in the dry ingredients this includes the flour, baking powder, chilli powder, cayenne pepper, cocoa powder, cinnamon and bicarb and stir with a spoon. Now, add your dry ingredients to your wet ingredients 1/3 at a time. 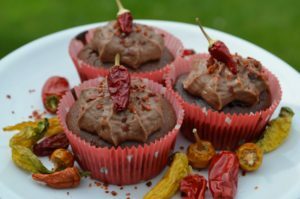 Once all of your ingredients are mixed together, spoon the cupcake batter into the paper liners and place in the oven to cook for 15- 20mins. Once the cupcakes are ready, they should spring back to the touch. Remove them from the oven and leave to stand in the cupcake tin for 5 minutes. Once the 5 mins is up, remove them from the baking tray and leave to stand on a wire cooling rack until they are completely cold. Whilst they are cooling you can prepare the buttercream. In a clean, dry bowl add the butter and beat continuously until the colour change occurs from a yellow colour to a pale cream colour. Then, add in the icing sugar slowly (make sure you don’t use an electric mixer as the icing sugar will end up all over your kitchen other than in your butter cream). Once all the icing sugar has been added, the mixture will feel quite tough so, add in the melted chocolate and milk to loosen it up. Add in the chilli powder and mix well. 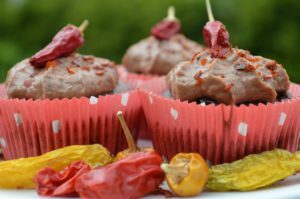 Pipe onto the cupcakes and sprinkle the cupcakes with chilli flakes for decoration. 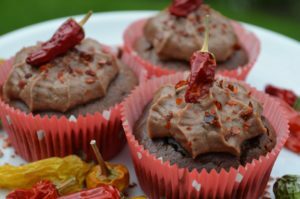 There you have it, my Chilli Chilli Chocolate Cupcakes, they’re so good I named it twice!! !